Aligned with their motto ‘Inspire, Believe, Succeed’, Bedford Drive Primary School wanted to take full advantage of their multi-million pound rebuild by ensuring the very latest technology was adopted. Working in partnership with Hi-Impact, the school’s technical support provider and computing consultants ELe® introduced a tailored ultra-low energy computing solution to support the school’s ambition to improve its sustainability profile. 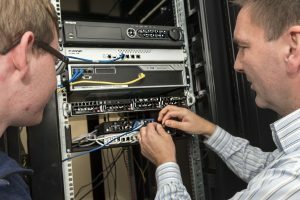 A Power over Ethernet (PoE) solution utilising ELe®’s Power Injector was recommended and installed to power the schools desktop computing via its existing Ethernet cabling. 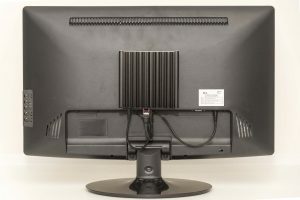 Hi-Impact installed 24 ELe® NUC Intel PC’s and Monitors for use by students, teachers and support staff. An additional 21 ELe® NUC Intel PC’s were then installed to operate the 65 inch teaching screens in each of the new classroom spaces. ELe®’s very latest product – a DC powered server was then installed at the school. The Intel Xeon E5 Server is now supporting the whole school and is consistently running at below 100 watts per hour, giving an energy saving of more than 50% versus their standard energy usage. The Hi-Impact installation, powered with ELe® technologies has enabled the school to achieve 70% energy savings. Beyond the energy savings however, the whole team at the school is now benefiting from the new computing solutions.